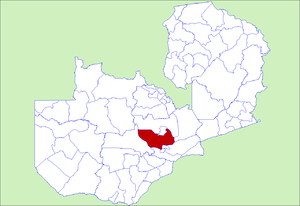 Chibombo District is a district of Central Province, Zambia. As of the 2010 Zambian Census, the district had a population of 293,765 people. Its headquarters are at Chibombo, and it lies between the Lukanga Swamp in the west and the end of the Luangwa Valley in the east. It includes good commercial farmland north of Lusaka. This page was last edited on 14 July 2016, at 16:40.